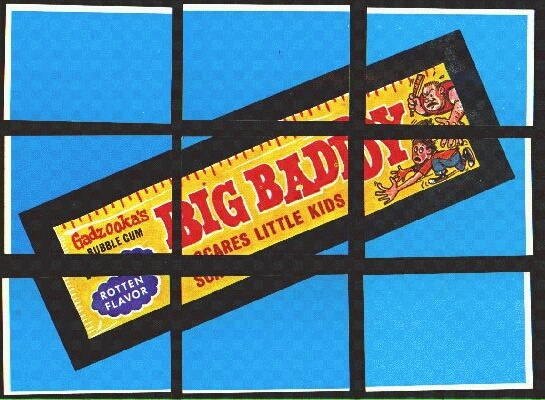 From 1973 to 1976, Topps released 16 series of Wacky Packages known as the Original Series. 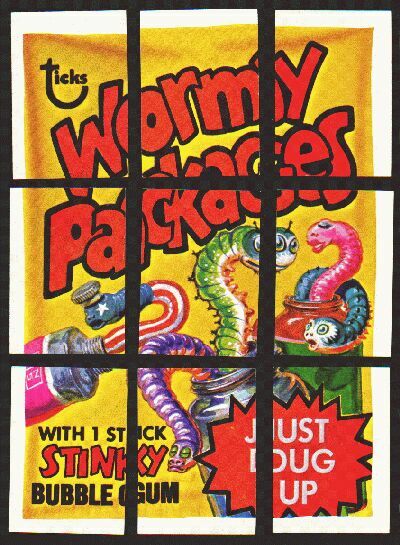 These peel-off adhesive-backed stickers became a huge seller for Topps. 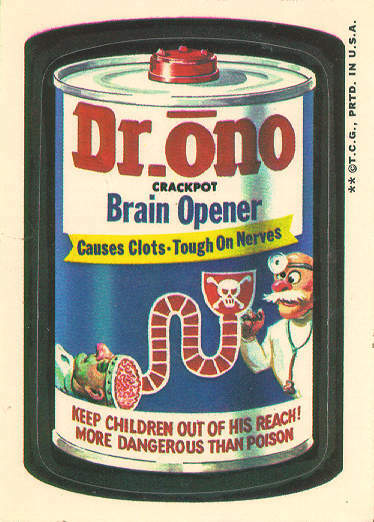 There were about 30 stickers in each series issued. The stickers came in 3 different varieties: Whiteback, Tanback, and Ludlow. 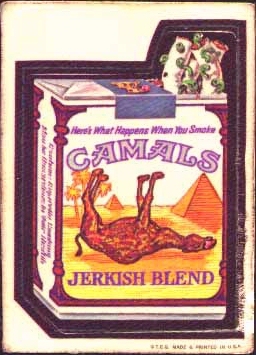 The Ludlows have a drawing of a camel on the back (either in red or black). 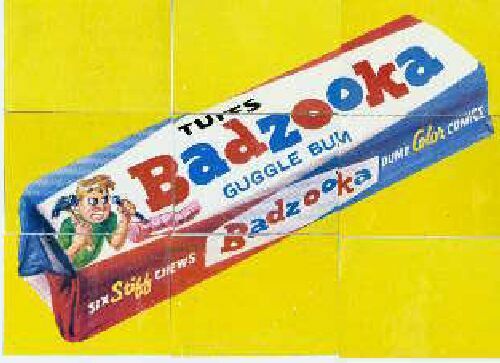 Some early stickers were even made of a Cloth material. The 1st and 2nd series stickers are generally harder to find then the 3rd thru 13th series, but the 14th thru 16th series stickers are even more difficult to find since they were sold in smaller quantities. 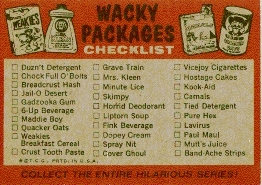 Each series came with checklists that, when put together, form a puzzle picture. For reference, I have included a list by series and alphabetical list of every sticker. You can also download my Original Series Spreadsheet to keep track of your collection. 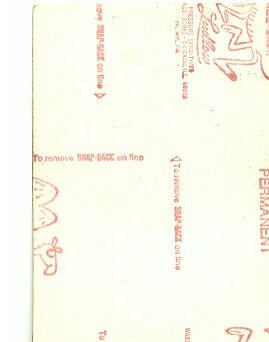 The stickers shown below are the hardest to find in each series. 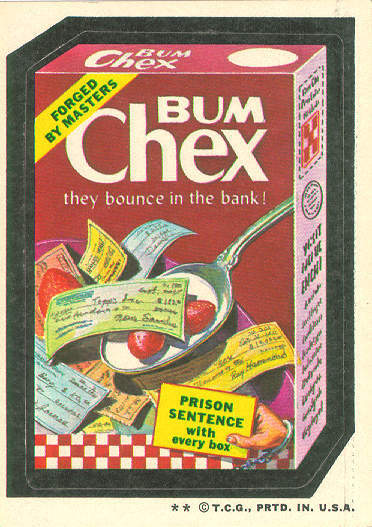 Summary: This was the first of the original 16 series Topps released in 1973. 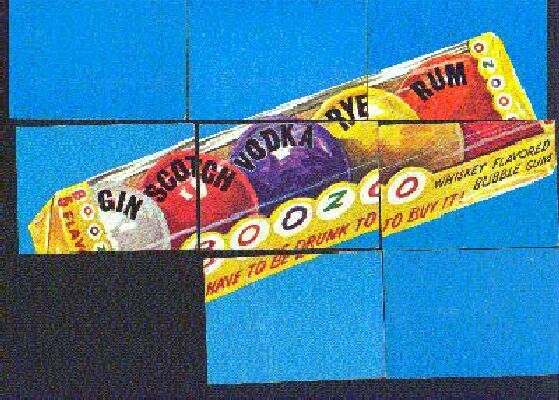 Band-Ache, Lavirus, Mutt's and Paul Maul were short prints, making them more difficult to find. 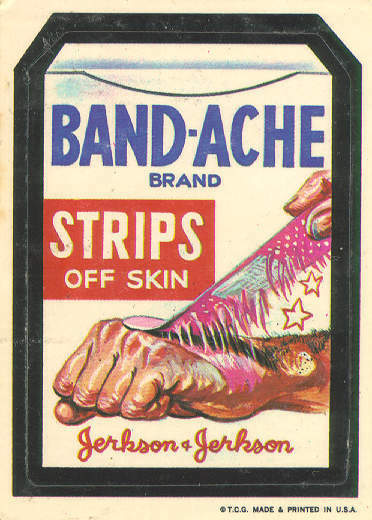 Band-Ache is rumored to have been removed from production making it the hardest to find. Summary: There is a blank spot on 5th series checklists which indicates there was a sticker removed before its release. 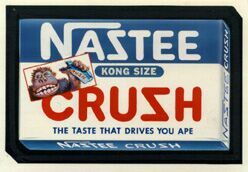 A recent discovery of diecut variations in Cram stickers prove it was the never-released title Nastee Crush. 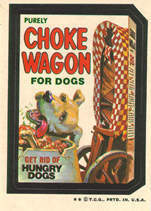 Summary: There were 2 versions of the sticker Grime Dog Chow. 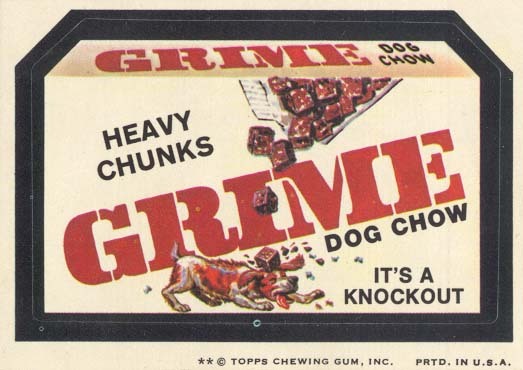 The common version says Grime - Dusty-Greasy Chunks, while the hard to find version says Grime - Heavy Chunks. A debate continues as to which one came first. Summary: Some 13th series whiteback stickers have recently been discovered, but not enough to indicate any large production. 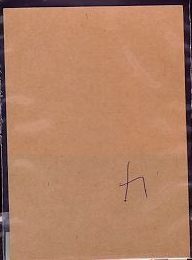 It is still considered a tan-back only series. 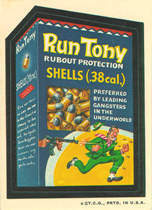 Summary: This series was printed in both tanbacks and whitebacks. The tanbacks are harder to find. 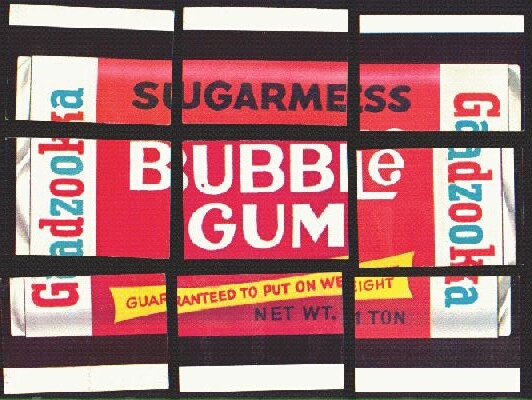 Interestingly, Sugarmess Gum was reprinted from the 2nd series and the only way to tell the difference is by the 1975 copyright. Summary: This series was printed on whitebacks. There was a rumor that 2 stickers (Fang and Pounds) could be found with tanbacks, however this rumor has recently been proven false. Summary: This was the last set of the Original Series. 1 out of every 4 Scoot stickers were printed without a copyright, which makes them harder to find. The stickers say 1976, but this set wasn't actually released until mid 1977. 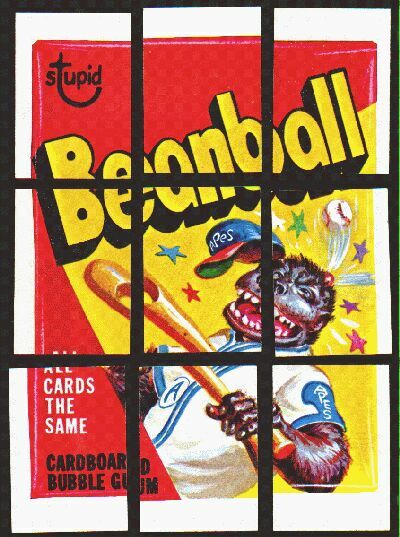 Due to it's late release, different wrapper, and higher price, many boxes were never sold and were either sent back to Topps or purchased by dealers. 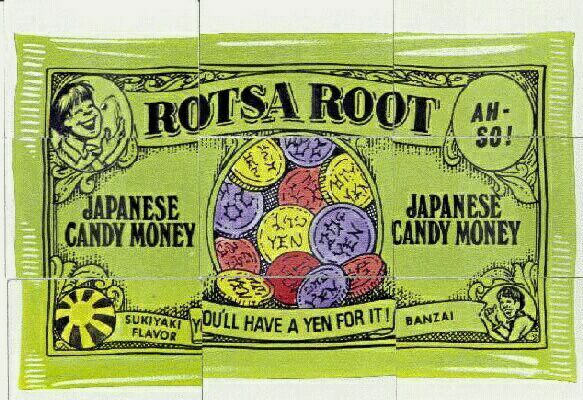 Most wacky collectors never knew this set even existed until recently. 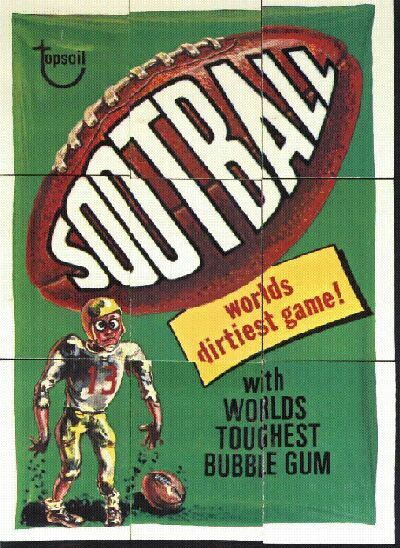 The jury is still out on it's scarcity. The prices indicate they are tougher to find then series 15, but dealers continue to bring unopened boxes of them to market.